How can your team sustain the gains and build upon the benefits of the initial training program? No worries.. Your Pinnacle Performance relationship provides an exclusive, evolutionary training program that will keep your team on the winning track, continue to improve productivity and performance, and ultimately institutionalize the Pinnacle Performance sales/customer service/winning team culture model in your tire/auto service company! All too often sales/customer service training is treated as an event. A business conducts an in-house training and, assuming it was good, participants get energized with new insight, techniques and tools. Then, with no real follow-up program in place, participants fizz out and return (at varying speeds) to the same level of performance they were at prior to training. Like physical fitness, it doesn’t matter how good your workout at the gym is today. If you don’t continue to exercise on a consistent basis, you will never truly get in shape and stay that way. Proper training is an ongoing process of continuous professional development. Just like a professional sports team, your sales/customer service team must regularly practice and work on their game through a disciplined and committed training program if they are to consistently win in (and for) your business. 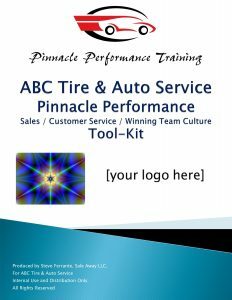 Steve will produce the “Pinnacle Performance Sales/Customer Service/Winning Team Culture Tool-Kit” exclusively for your tire/auto service business. This comprehensive training/reference guide is branded-for- your-business and details content from Steve’s highly-acclaimed Pinnacle Performance training program with valuable lessons to further the sales, customer relations performance and professional development of participating personnel. Your team’s tool-kit will consist of 26 individual lessons with methodology, best practices, technique and process information consistent with the Pinnacle Performance Sales/Customer Service/Winning Team Culture training model. Wouldn’t it be awesome if your team could have it’s very own training community hosted by a sales, customer service and winning team culture expert? Yes, yes it would. For effective implementation of the training tool-kit and associated professional development content , Steve will concurrently host and maintain the “(Your Company) Pinnacle Performance Portal”; a private, online training community exclusively for your business’s designated sales and service personnel. The portal site will serve to implement the Pinnacle Performance Sales/Customer Service/Winning Team Culture Tool-Kit and secure the program for on-boarding of new company employees and ongoing support of existing team members. Utilizing the portal, tool-kit training lessons will be introduced on a bi-weekly basis. Each tool-kit training lesson will include a companion online test with 6-8 multiple choice questions related to the associated content, enabling personnel to “test out” the lesson and their understanding of the content. In addition to tool-kit training lessons, the portal will be regularly updated with professional development subject matter in the form of articles, video clips and associated professional development lessons that appropriately tie into the Pinnacle Performance Training model. An Exclusive Relationship To Dominate Your Market! During the course of training implementation, Steve will function as your “Sales Coach in Your Corner”, an extension of your business’s sales/customer service management. In this capacity, Steve will monitor the online training portal and maintain “real-time” communication with your designated sales and service team members to provide unlimited coaching support as needed. 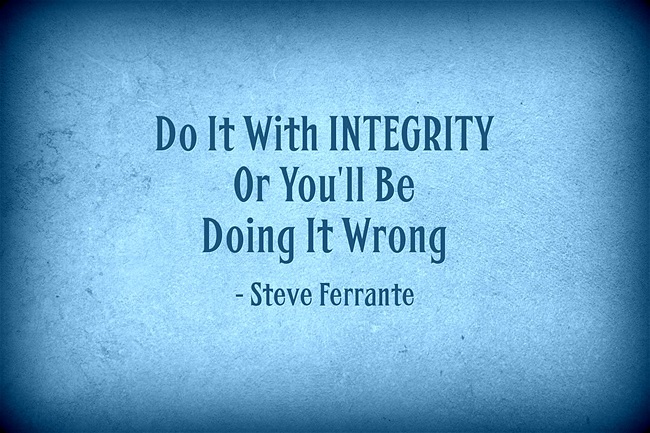 Steve believes lasting customer relationships are built on a foundation of integrity. With that, Steve will honor an exclusive relationship whereby he will not entertain and/or work with another tire/auto service business that directly competes with your business in its regional market for the life of our relationship. This may not sound like a big deal.. until Steve is working with one of your major competitors.. then it’s a VERY BIG DEAL! * Must have a minimum of 3 store locations to qualify. Pinnacle Performance Is Designed To Be The Only Sales/Customer Service/Culture Training Program Your Tire/Auto Service Business Will Ever Need! With regular on-site training, integrated online training, ongoing support and coaching, and available call recording/evaluation services, Pinnacle Performance provides an evolutionary process to develop and sustain your team’s performance and power your business to new levels of success!